همانطور که از عنوان پیداست مخفف کلمه Serial Attached SCSI می باشد ، در واقع این تکنولوژی یک انقلاب در تبدیل کردن Parallel SCSI به یک رابط نقطه به نقطه سریال یا point to point serial interface بود که مستقیما به دیسک درایوها متصل می شد. تکنولوژی SAS در مقایسه با SCSI های قدیمی از کارایی های بسیار بالاتری برخوردار است که از آن جمله می توان به امکان اتصال همزمان حداکثر 128 عدد دستگاه جانبی مختلف با سایزهای مختلف با کابل های کوتاه و بلند را نام برد. در حالت Full Duplex یا دو طرفه همزمان شما می توانید سرعتی تا 3 گیگابیت بر ثانیه را در این نوع تکنولوژی بدست بیاورید و علاوه بر اینها برعکس SCSI های قدیمی شما می توانید از دستگاه های SAS بصورت Hot Plug نیز استفاده کنید. با این کابل می توانید هارد SAS را به پورت SATA مادربورد اتصال دهید. این کابل در 2 نوع است یکی 22 پین و دیگری 29 پین ، که بستگی به نوع هارد باید کابل مخصوص به آن را انتخاب نمایید. لازم به ذکر است که اکثر هاردهای hp و بعضی از هاردهای Segate قادر به انتقال دیتا به مادربرد غیر از مادربرد اولیه که با آن Setup شده را ندارد. 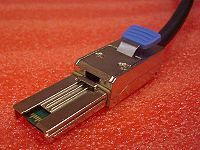 The SAS connector is much smaller than traditional parallel SCSI connectors, allowing for the small 2.5-inch (64 mm) drives. Commonly, SAS provides for point data transfer speeds up to 6 Gbit/s, but 12 Gbit/s products have begun shipping in 2013. SFF-8086 Internal mini-SAS, internal mSAS Internal 26 4 This is a less common implementation of SFF-8087 than the 36-circuit version. The fewer positions is enabled by it not supporting sidebands. SFF-8087 Internal mini-SAS, internal mSAS, internal iSAS, internal iPass Internal 36 4 Unshielded 36-circuit implementation of SFF-8086. Molex iPass reduced width internal 4× connector with future 10 Gbit/s capability. SFF-8088 External mini-SAS, external mSAS, external iSAS, external iPass External 26 4 Shielded 26-circuit implementation of SFF-8086. Molex iPass reduced width external 4× connector with future 10 Gbit/s capability. SFF-8470 InfiniBand CX4 connector, Molex LaneLink External 32 4 High-density external connector (also used as an internal connector). SFF-8482 Internal 29 1 This form factor is designed for compatibility with SATA. The socket is compatible with SATA drives; however, the SATA socket is not compatible with SFF-8482 (SAS) drives. The pictured connector is a drive-side connector. SFF-8484 Internal 32 (19) 4 (2) High-density internal connector, 2 and 4 lane versions are defined by the SFF standard. SFF-8485 Defines SGPIO (extension of SFF 8484), a serial link protocol used usually for LED indicators.